How does the heart beat? | Norton Children's Louisville, Ky.
Norton Children's / Get Healthy Families / Services / Heart / How does the heart beat? How does your heart beat? Your heart beats because of the actions of a highly specialized electrical system. It listens in to what’s going on with you at the time and triggers the muscular walls of the heart to contract in an organized fashion and at the right heart rate, either slow or fast, and usually just right. The heart’s beating constantly pumps blood through tubes (blood vessels) to all parts of the body. For the heart to be an effective pump, the heart’s “plumbing system” and “electrical system” must both work correctly and coordinate with each other. The electrical system of the heart consists of special cardiac cells or tissues that use electrical signals or impulses to coordinate the contractions of the muscular walls of the cardiac chambers. Each time that an electrical signal spreads across a chamber of the heart, the muscular walls are triggered to contract. Proper coordination of these signals ensures that the chamber walls squeeze at the right time and in the correct manner so as to provide an effective heartbeat. Each normal heartbeat is started by the normal “pacemaker” of the heart, the so-called sinus node, which is found in the upper part of the right atrium. The sinus node has its own clock, and at the right time it sends out an electrical impulse that will spread from cell to cell across the muscular walls of the right and left atria. Once electrically triggered in this way, the muscular walls of the atria contract, squeezing blood down into the ventricles through one-way valves. The same electrical impulse that started the heartbeat then spreads down into another specialized tissue, the atrioventricular or AV node. The AV node is located in the middle of the heart, between the atria and ventricles, and is the only tissue in the heart where there is a normal “electrical connection” between the upper atria and the lower ventricles of the heart. Once the electrical impulse enters the AV node, it is delayed briefly, allowing time for the ventricular chambers to be filled by contraction of the atrial walls. After the brief delay, the same electrical impulse that started everything is then conducted down to the ventricles through other specialized tissues (the so-called “bundle of His” and “bundle branches”), whereby it rapidly spreads across the muscular walls. Once that happens, the ventricular walls are triggered to contract, squeezing the blood out of the heart through other one-way valves into large arteries to the lungs and body. After a normal heartbeat is completed, everything rests for a moment, and then the whole cycle starts up again. Call to learn more about our services or to schedule an appointment with Norton Children’s Heart Institute. You can hear the heart’s pumping action whenever you listen to the heart with a stethoscope and hear the regular “lub-dub” of each heartbeat. Also, you can notice the effects of each heartbeat when you feel a pulse by holding a finger over an artery (for example, in your wrist or neck). Recall that someone in the doctor’s office usually checks how fast your child’s heart is beating by feeling a pulse. The pulse rate (number of beats per minute) is one of the important “vital signs” that providers regularly check. Normal coordination of each heartbeat is just the first step to provide the right amount of “cardiac output” to supply the body’s needs. Your body needs higher cardiac output during exercise or strenuous activities, and less when you’re at rest or asleep. So in addition to synchronizing the heart’s chambers during each beat, the heart’s electrical system is also responsible for adjusting how fast the heart should be beating at any point in time. The way that normally happens is that the sinus node “listens in” to messages from various nerves and bloodborne chemicals such as adrenaline circulating through the bloodstream. The sinus node then adjusts the rate of impulses it sends out accordingly. This is why heart rates in otherwise healthy people are highly variable, and depend on factors like age and level of activity. For example, little babies quietly at rest usually have heart rates around 120 to 150 beats per minute, compared with 60 to 80 beats per minute in most resting teenagers. A toddler’s heart rate may be 110 beats per minute while eating her favorite lunch, but get up to 220 beats per minute when she’s really upset and crying. An athletic teenager’s heart rate may be 40 beats per minute when he’s asleep, but get up to 200 beats per minute when he’s running flat out. When the heart doesn’t beat as it should, that is called an arrhythmia. 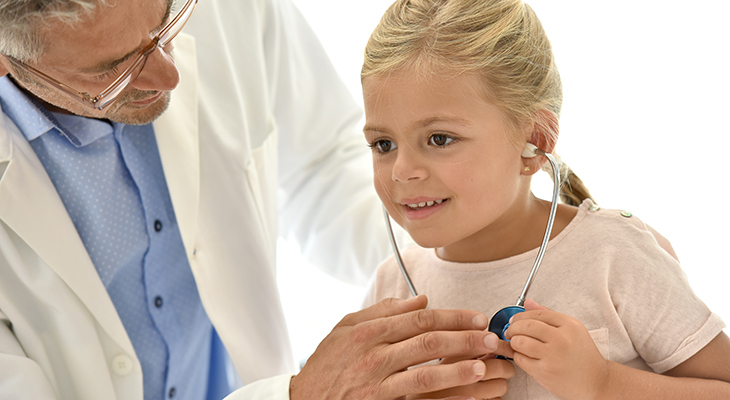 Christopher L. Johnsrude, M.D., is an associate professor in the University of Louisville Department of Pediatrics and serves as director of the pediatric arrhythmia service at Norton Children’s Hospital.